CES 2011: LG's new 3D Blu-ray players and systems revealed | What Hi-Fi? LG has confirmed its new generation of 3D Blu-ray products will be in UK shops by Easter – more details to follow in a special LG CES blog. Predicting an explosion in interest in 3D for 2011, LG Electronics has revealed the range of 3D home entertainment products it plans to launch at next month's Consumer Electronics Show (CES). The products will include the HX996TS and HB906SB 3D Blu-ray systems and the BD690 networked 3D Blu-ray player. We'll have to wait until January to find out UK prices and release dates, but we've got the tech specs below. The HX996TS 3D Blu-ray system aims to offer sound "as deep and lifelike as any 3D image," claims LG. 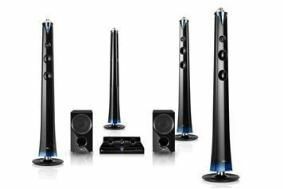 It has a Vertical 3D Effect Channel feature, which works by emitting sound through the tops of the system's four floorstanding speakers. "The resulting audio waves completely fill the space above viewers' heads, creating the illusion that they're right in the middle of the movie," says LG. The HX996TS system has already scooped a 2011 CES Innovations Honoree Awards (of which more here). The second 3D Blu-ray system is the HB906SB, which LG boasts has 1,100 watts of output, plus seven different modes of LG's signature Sound Gallery, backed by the company's new Digital Signal Processing (DSP). Both of new systems offer a range of connectivity, from HDMI to USB to wi-fi. They also have an iPod/iPhone cradle dock. Lastly, the BD690 is a new network 3D Blu-ray player, which promises "an on-board digital media library", thanks to an integrated 250GB hard disk. The products are expected to be available in early 2011 - we'll bring you the details, including pricing, when we can. In the meantime, here's those promised tech-specs. LG HX996TS 3D Blu-ray system: 7.2 channel; 1280W; LG Sound Gallery with parabolic speaker; USB recording (MP3 file creation from music CD); 2 HDMI In (HDMI 1.4), ARC (Audio Return Channel); Firmware upgradeable for advanced function and services; External HDD playback (DivX HD, MKV); Music ID capture and streaming (Gracenote); iPod / iPhone cradle; Wi-Fi direct, Ethernet, DLNA compliant; Smart TV Technology: Premium Content and LG App. Store; Mobile Remote App. LG HB906SB 3D Blu-ray system: 5.1 channel; 110W; LG Sound Gallery with parabolic speaker; USB recording (MP3 file creation from music CD); 2 HDMI In (HDMI 1.4), ARC (Audio Return Channel); Firmware upgradeable for advanced function and services; External HDD playback (DivX HD, MKV); Music ID capture and streaming (Gracenote); iPod / iPhone cradle; Wi-Fi direct, Ethernet, DLNA compliant; Smart TV Technology: Premium Content and LG App. Store; Mobile Remote App. LG BD690 Network 3D Blu-ray player: integrated 250GB hard drive; Smart TV Technology: Premium Content and LG App. Store; Built-in Wireless LAN (Wi-Fi) / Wi-Fi Direct; Stored Contents Sharing; Bi-Directional Content Sharing (DLNA Server and Client); Mobile Remote App.